What Kind of Cancer Did Paul Newman Die From? Many people heard that Paul Newman died from cancer, but fewer heard that lung cancer was to blame. Unfortunately, whether people are celebrities or not, the stigma of the disease has prevented many people from talking openly about their diagnosis. What do we know about Paul Newman's cancer diagnosis, and what can we assume he wished everyone knew about the disease? Paul Newman died from lung cancer at the age of 83 in his home in Westport, Connecticut. Though the public didn't hear much at first, he, unlike many celebrities with lung cancer, was open about his diagnosis before his death. Actor, producer, race car driver and philanthropist Paul Newman starred in films in an era when smoking was considered “sophisticated.” He was apparently a chain-smoker back in those days but quit smoking 30 years before his diagnosis was made public in June of 2008. Newman’s story is not unique. While it's clear that smoking causes lung cancer, the majority of people who develop lung cancer do not smoke. Roughly 15-20 percent of people who develop the disease have never smoked, and another 50 percent are former smokers who have long since kicked the habit. In other words, though the public was surprised that Dana Reeve, the 44-year-old never-smoking wife of "superman" passed away from lung cancer though she never smoked, this isn't uncommon. Learning about lung cancer in non-smokers is important in more than one way. At the current time, lung cancer is often diagnosed at a more advanced stage in people who never smoked. In addition, the common symptoms of lung cancer can differ between smokers and non-smokers, with a vague sensation of shortness of breath (often attributed to aging or inactivity) being a common symptom among those who have not smoked. How Long Did Paul Newman Live With Lung Cancer? We don’t know exactly how long Paul Newman lived with lung cancer. In June of 2008 it was rumored, then denied, then confirmed that Paul Newman had the disease. He passed away on September 26, 2008, 3 months after his diagnosis became known. In 2007 Paul Newman said he was retiring from acting, but cited reasons other than health concerns. In May of 2008, he announced he would not be directing “Mice and Men” because of health problems. It may be that Paul Newman desired the privacy that many famous people are denied. Or it may be the stigma of lung cancer, that unspoken sense that somehow people with lung cancer deserve the disease, that kept him silent at first. Nobody deserves a diagnosis of cancer. Hopefully, others like Paul Newman will open up about their diagnosis, and help to raise awareness about lung cancer—the leading cause of cancer deaths for both men and women in the United States. There are many ways people will remember Paul Newman that go far beyond his death from lung cancer. Perhaps the best memories are of a man who upheld the value of marriage amidst the revolving door marriages of tinsel town. Paul Newman was first married to Jackie Witte and had 3 children. 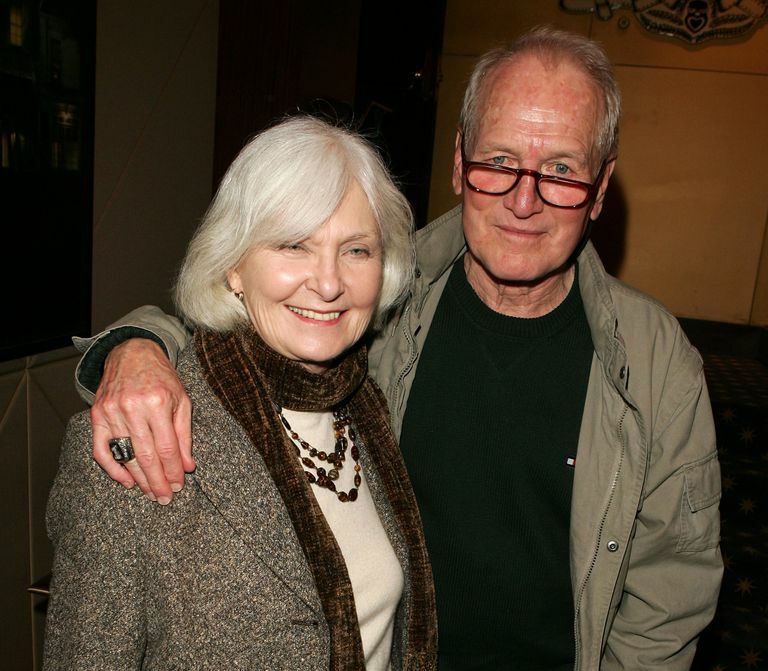 His next wife, Joanne Woodward remained his wife until his death. Paul Newman's marriage and his thoughts on marriage show a tenderness that we should remember more than that he was a former smoker who got lung cancer. Paul Newman wasn't alone in being a celebrity with lung cancer. Even though it's likely that many have kept quiet, there are several celebrities who had lung cancer ranging from Dana Reeve and Peter Jennings to the "quiet Beatle" George Harrison and even artist Claude Monet. It's hoped that going forward, more celebrities with lung cancer will come forward, without the fear of the stigma of the disease. Paul Newman's death saddened many of us, but we believe he would be pleased that, if through his death, others would become aware that anyone can get lung cancer. People who quit smoking decades ago can get lung cancer—the risk never returns to normal. And people who have never smoked a single cigarette can get lung cancer. Talking about Paul Newman and other celebrities with lung cancer in recent years raises a very important point which the public has not understood. Lung cancer at this time is more common in non-smokers. Those most likely to develop the disease are former smokers—those who quit smoking years, or even decades ago. We have been reassured about the advantages of quitting smoking—and there are many. (Check out these benefits of smoking cessation). The risk of heart disease begins to drop almost before the fire goes out. Yet, while quitting lowers the risk of lung cancer, that risk never returns to normal. One of the problems with this is that current lung cancer screening guidelines (discussed next) recommend screening for those who still smoke or quit in the past 15 years. But many people who kicked the habit 20 years or even 30 years ago still carry a significant risk of the disease, just as Paul Newman did. If this is you—someone who quit more than 15 years ago, have a careful talk with your doctor. You may also need to do a little research on your own. A 2016 study found that half of primary care doctors are unaware of the current guidelines for lung cancer screening to begin with, which could make it difficult to discuss if you are someone who doesn't quite meet the guidelines but could benefit from screening anyway. More recently, a 2018 study found that, even though roughly 75 percent of primary care physicians agreed that the benefits of lung cancer screening outweighed the risks, most of the physicians had made five or fewer referrals for lung cancer screening in the previous year. Considering the great numbers of people who are eligible for screening (discussed below), this would imply that referrals are not being made for many people who could benefit. And benefit, in this case, means a greater chance of surviving the disease should it occur. If lung cancer screening had been available when Paul Newman was alive, screening would likely have been recommended by a physician familiar with the benefits and risks. Keep in mind that almost twice as many women die from lung cancer than breast cancer and almost three times as many men die from lung cancer than prostate cancer. And—as we've been noting—you don't even need to have smoked to be at risk. In other words, there are many reasons why quitting smoking won't eliminate lung cancer deaths. If this fits you, talk to your doctor about screening. Lung cancer is much more treatable in the early stages of the disease, though treatments for advanced lung cancer, as well as survival rates, are improving. Whether you've smoked or not, familiarize yourself with the early symptoms of lung cancer. Without a general screening test, this is the only way to detect lung cancer in the majority of people. And anyone, absolutely anyone who has lungs, can get lung cancer. Eberth, J., McDonnell, K., Sercy, E. A National Survey of Primary Care Physicians: Perceptions and Practices of Low Dose CT Lung Cancer Screening. Preventive Medicine Reports. 2018. 11:93-99. Raz, D., Wu, G., Consunj, M. et al. Perceptions and Utilization of Lung Cancer Screening Among Primary Care Physicians. Journal of Thoracic Oncology. 2016. 11(11):1856-1862. How Does Lung Cancer Kill People?